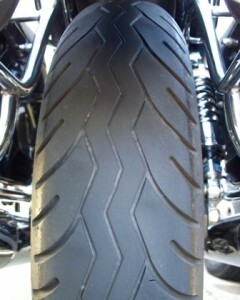 I made it past 10,800 miles on the original Metzeler Lasertec tires that came on Moto Guzzi California Vintage. The center tread has worn thin, so new tires are the topic of discussion. 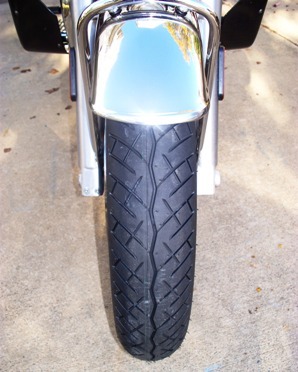 I’m considering which new motorcycle tires to try next, and where to get them. Because it is now a 2 hour ride to my nearest Moto Guzzi dealer, I am not too sure about riding all the way out there just for tires. 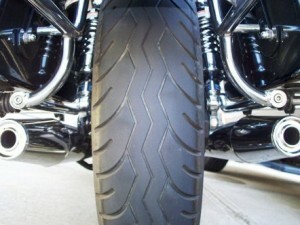 Metzeler has long been one of my favorite brands of motorcycle tires. That all started when I rode dirt bikes as a teen. 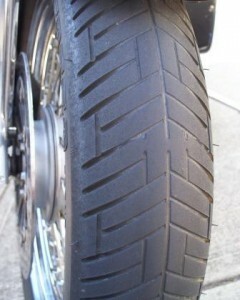 The Guzzi factory equipped Lasertec tires have been very good overall in my opinion. I don’t really ride hard, I don’t do “track days”, and I admit that I don’t attack twisty roads like some guys I know. The great majority of my riding is simply commuting to work. At the end of the day, these Metzeler Lasertecs have suited me very well, with only a few minor complaints. One minor complaint about the Metzeler Lasertec comes from when my California Vintage was still relatively new. The front tire would grab very hard onto any minor deviation on the road surface. Motorcycles do this anyway, but mine did it so strongly that it was hard to fight against. Since the front center tread has worn down, it no longer seems to grab and follow cracks as aggressively as it used to. I can easily counter that action, whereas before I had a difficult time countering it. Could just be me, but maybe the straight center groove on the Lasertec front tire design contributes to this effect. Not so much a complaint as it is an observation is that my Lasertec rear tire has some wear that seems odd to me. The tread towards the sides (the so-called chicken strips) has a saw-tooth wear pattern to it. 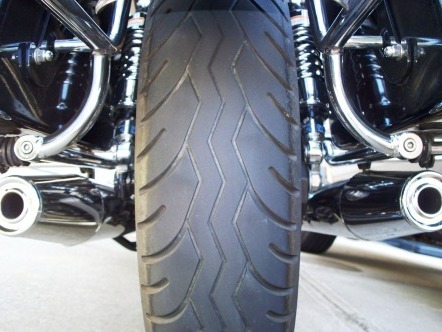 The saw tooth wear pattern runs front to back between the side tread blocks. The leading edges of the tread blocks have worn lower than the trailing edges. I’m vigilant about maintaining tire pressures (32 psi front / 42 psi rear), so I don’t think this was caused by low pressure. If anyone knows what caused this wear (or if it is considered “normal”), please leave a comment at the end of this article. The Bridgestone BT-45V tire has generated some buzz among Guzzi enthusiasts. This tire seems very comparable to the Lasertec, but some believe the Bridgestones have a better ride and more grip. Remember how your new sneakers made you feel like you could run faster when you were little? I’m sure the same effect happens when you give your motorcycle new pair of “sneakers” too, and why shouldn’t they? I was unable to find any Moto Guzzi motorcycles in their guide online which is mostly Japanese. The Moto Guzzi California Vintage has spoked wheels that require tubes. The tire sizes are 110/90 18 front and 140/80 17 rear. Bridgestone BT45V tires are available in those sizes at similar or lower prices than the Metzeler Lasertec tires. Users of the BT45V are saying they get a pretty similar life out of them too. So, this all sounds pretty good so far to me for giving these a try next. Obviously, I don’t need V-rated high speed tires on my Vintage, but that’s ok since the price is still ok. Bridgestone doesn’t offer the H-rated BT45 in the size needed. I checked the 2011 Michelin motorcycle tires fitment guide to see what they offer. 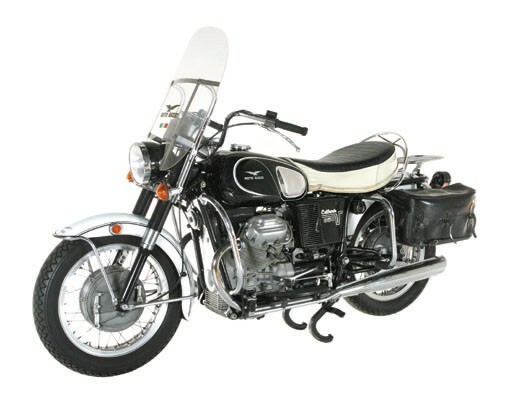 They list several models of Moto Guzzi motorcycles, but the only California they list is the 1985-1986 V65 California. Michelin has tires listed for the v7, Bellagio, Breva, Centauro, Norge, Stelvio, Griso, Quota and V11, but none listed for the modern era Moto Guzzi California. I did find the Michelin Pilot Activ available in 110/90 18 front, but not in 140/80 17 rear. Pirelli motorcycle tires web site has a “suggested fitment” menu. So, I typed in Moto Guzzi, selected California Vintage, and the results were “Unfortunatly no tyre available”. Oh well. I also checked the rest of the California series including EV, Stone, Aluminum, 1100i, etc. and got the same results. The Metzeler 880 is always a popular choice for a really long lasting tire with a proven reputation. These are available in sizes to fit the Moto Guzzi California, including the Vintage. They do cost a little more than some others, but since they last so long and ride decently, then the cost is pretty well justified. They’re considered a touring tire, not a sport-touring tire, so expect a little harder tread and perhaps not quite the grip that soft compound or dual compound tires typically provide. Since there are no Moto Guzzi dealers in my area anymore, I’m weighing my options about where to have my Cal Vin tires changed. I could take it to a non-Guzzi dealer locally, or I suppose I could ride to the nearest Guzzi dealer a few hours away. Removing the wheels and carrying them in somewhere for the mounting and balancing is something I am also considering doing as a cost-savings measure. The costs I have seen for mounting new tires on a shaft drive motorcycle are higher than for chain or belt drive bikes. Quotes I have for a full service tire change (ride in on old tires and ride out on new) are close to $400 by the time I get done with tax and everything. That is the same as it costs to have a new set of tires mounted and balanced on my car. As Murphy’s law dictates, my car is also due for new tires now. Ouch. I’m a low-budget rider with a young family. These new tires will be a significant expense for us. Several online stores offer really good prices for motorcycle tires, but so far, I have found that Motorcycle Superstore is about the best for cost, customer service, and free shipping. So, ordering my new tires online is what I will probably do, but stay tuned and I’ll share what I did. By the way, which brand and model of tires do you have on your Moto Guzzi California? Would you get the same ones again next time? Since writing my previous comment I have continued to fit Metzeler Lasertec Front and Rear. A comment on a Moto Guzzi Facebook page led me to check Metzeler’s recommendations for Tyre Pressure (rather than Moto Guzzi’s recommendations from the year 2000). I’ve now stopped using 32/36 and follow the advice of the Tyre Manufacturer at 33.5/42.1, and consider that it handles better and the tyres lasts longer. I know that this is some years later but I would be interested in an update. I just swapped from Bridgestone Battlax BT45 after 7,600 miles (on rear). They squirmed about on any piece of tarmac that had been repaired, or any cracks in the roadway. They stuck to the road well round the corners and stopped without drama, wet or dry. I just felt that they were trying to communicate to me too much (much as Dunlop TT100’s did, and Avon Road runners didn’t, back in the early 80’s). The tyre shop had BB, Avon Road riders, Metzeler Lasertec. I asked for advice and the tyre guy pointed out that Metzeler Lasertec are fitted as standard by Moto Guzzi. That and the slightly cheaper price for ML vs AR or BB helped me to decide. I am so pleased that I went with Metzeler. They cope with differing road surfaces without tracking lines or tracing every piece of tarmac repair. I soon saw the chicken strips worn away and am enjoying them and the bike so much more than the last tyres. Was the poster/commenter who went from Metzeler Lasertec to Bridgestone Battlax happy with his choice? Tubless tires: The original Metzlers on my 03 EV did well. They have not been available for sometime. My mechanic who seems to be concientious on mounting and obtaining tires suggested Lasertec (a currently available tire) and they did not last. The rear size seems to be controversial even though the bike originally had a150/70-17 rear. Finding that size seems to be tough. I really disliked the 140/80-17 that the California has come with for years. Now I have a 150/70-17 Pirelli Sport Demon (size seems to have come available in the last couple of years) and I have no opinion. The front I had replaced with, I believe, is a Dunlop which does not match because of timing at my local Kawasaki dealer. I still do not have a match for the Sport Demon mounted on the front beause it was back ordered took at least a month after the rear was replaced. Life/family issues have delayed me getting that front tire mounted. My mechanic is about 80 miles away. Incidently, on one of the Lasertecs rears, I got a large nail when it was new. I think that I rode on it for a couple of days and pulled it and it went flat, of course. I used the push through patch and wore that tire out. When the tire was replaced, it looked good on the inside and the outside. I’m really happy with the Metzler ME880’s. I am astounded to have 11,500 miles on the current set and have at least several hundred miles left in the rear. The front looks like it could go another several thousand miles. This set has taken several long distance high speed trips. The stiffer sidewall improves corner handling. Surprised to see the CalVin still running the same size tire as my ’00 Bassa. Getting hard to find. From what I’ve read, and on the earlier models, some tires in the 140/80 size will rub on the swingarm in the twisty bits. 130/90s work well and that is what was on my bike when I got it, and what I run now. When I bought by Bassa it was running Avon Super Venom, got over 10k miles. That tire is now the AM18/AM20. Unfortunately no longer available in that size. When I noticed I balded the rear last year, away from home, I was lucky to find the 130/90 in stock. A Dunlop D404. Unfortunately that tire didn’t last 5000 miles, and I was far from home again last year when it went bald. Again, stuck with whatever they had in stock, an IRC I think, but at least I found one. I’m leaning toward the Shinko 230 Tour Master for my next set. Thanks to everyone for their input on tires. I finally decided on Bridgestone BT45V. V-rated tires are ridiculous for the CalVin, but the required size only comes in V-rating. Having them installed this weekend. I very carefully squeezed 11000 miles out of the original Lasertecs. I’m not condoning riding on bad tires, as you saw above I still had tread. Quick note re tires, tho possibly OBE as you may already have reshoed your CalVin. After OEM Pirellis died, I have almost exclusively (as in 95K) run Metzler 880’s. Can’t complain about mileage. Got c.10K on most rears, which, given my “fighting weight” and throttle proclivities, is, IMO, quite acceptable. Never quite as pleased about adhesion, and certainly got spoiled with MPR (and occasional MPP) on Norge and Ballabio. So, recently went to MPA’s. FWIW, I have a 110/80 18 front, and 140/80 17 rear. Maybe the tubed versions have different availability issues. I’m guessing the MPA’s won’t quite get 10K at back, but — using anecdata — believe better on traction. I can easily outride my competency, and the EV, while forgiving, needs help, too. I’ll likely not go back to 880’s if I can keep using MPA’s or similar, tho, again, the 880’s were fine. I have used Metzeler Marathon ME880’s front and rear on my Titanium since replacing the original Michelins at around 6,000. Mileage and performance have both been noticebly better. I take the wheel off and take it to Sturgis BMW/Suzuki (32 miles away). I have made a deal with the parts counter guy that if he comes within $10 of mail-order (Motorcycle Superstore, Dennis Kirk, etc…) I will buy from him. He always comes through and I pay them $20 to mount and balance. I replace tubes every other tire change and use a good Metzeler or Michelin. A few years ago I was on a ride to Calif on my wifes BMW R850R and stopped in Sparks Nev BMW. The Bridgestones that came on her bike were shot at 7,000 so I put ME880’s on. What a difference! I personally would stay away from Bridgestones or any other Asian rubber and go with the Metzelers. I have Metzler ME880 Marathons (140/80 B 17 M/C 69V) on my California. This replaced the original tire after the first 10,000 miles. Have matching ME880 on front and am pleased with their performance. The nearest Guzzi dealer is over an hour away. Luckily, I have a trustworthy independent shop in town that puts on the new skins. My Cal isn’t a Vintage, but I think you’d be pleased with these. I had AAA for over 20 years and never thought about calling them for a motorcycle break down. The only thing I would be concerned about is someone showing up in a tow truck and wanting to tie it on the lift to take it to the shop. Anyways I was riding motorcycles long before tubeless tires and potentially getting a flat never stopped me from riding then. I can’t wait to get a California Vintage. Michael, good question. I added roadside assistance to my motorcycle insurance policy after the Moto Guzzi roadside assistance period expired. Yes, I carry a pair of tire irons and I have AAA too, but am not so sure about AAA including motorcycles, do you know if they do? Not having tubeless tires is the only thing I do not like about the California Vintage. I just imagine myself getting a flat and having to change a tube out on the road somewhere. Do you carry a spare tube and some tire irons or a AAA membership? Great blog. Thanks for the time and effort.